A while ago, I was surfing the television channels for something to watch. 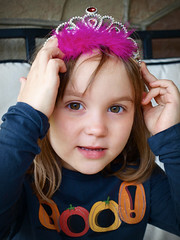 I settled on Kids and Tiaras out of curiosity. After about five minutes, I had to change the channel. I felt uncomfortable and pervertish sitting there watching girls who were basically still toddlers, parade around scantily clad and posing suggestively. I really couldn’t see the point this show was trying to make and didn’t want to stick around to find out. Here Comes Honey Boo Boo is a reality show about a 7-year old self-proclaimed beauty queen who made her way from being a contestant on Kids and Tiaras to her own fame, dragging her family along for the ride. (Or is that the other way around? I think her mom did the dragging). Alana Thompson, HBB’s real handle, has made it known that she doesn’t enjoy the limelight and hates meeting fans but the people who are leaching off her success apparently weren’t listening or couldn’t here her over the noise of the falling coins. I can’t hear you, Boo Boo, the ka-ching! is too loud! Here, have some more juice. I have an issue with this. Pedophilia is one of the most hated and disgusting crimes out there. Why? Because it preys on our innocent kids. In an ironic twist, we parade our little ones around in teasing attire for those with bad intentions to admire. Is it the money? If it is, then isn’t this a form of prostitution? Aren’t we then robbing our kids of their innocence by putting them through this? Isn’t this a form of ‘preying on innocent kids’ also? At 7 years old, Honey Boo Boo’s mom gives her a home-made brew of red bull and mountain dew, called Go Go Juice. This is equivalent to two cups of coffee and is given to keep the little honey awake for her stints. God forbid she falls asleep like a little girl. Red bull and caffeine to a 7-year old? Isn’t that what Britney Spears’ drink? What else are they giving her? Shows like Kids and Tiaras and Honey Boo Boo are embarrassments to our society. We preach one thing and do the other. We vow to protect our kids but we dangle them in dangerous situation that messes up their lives forever. Aren’t we a sick bunch? People who watch this crap and actually enjoy it are like those who would enjoy a real-life game of The Running Man. I don’t care how cute Alana is or how funny she was on Dr. Drew or Kimmel or whatever talk show she made her rounds on. This is wrong on all fronts. If you have no clue what I’m talking about, Google her. One of the best things is watching kids being kids. Unfortunately, they only have one chance at this. Should we deny them that chance? Note: I started this blog primarily to write about the funny side of serious situations but children are very dear to me and I can’t make light of anything that affects them negatively. Note: After publishing, I noticed that WordPress’ weekly writing challenge was debating whether kids should be allowed in adult oriented places. Well the situations mentioned in this blog are adult scenarios and ‘places’ that these kids are being placed in, are they not?